Tyger Hills Guest House is situated in Loevenstein, an upmarket suburb of Bellville. As an owner managed 3-star graded establishment you can expect very good quality in the overall standard of facilities, furnishings, service and guest care. This is the reason why our guests refer to Tyger Hills Guest House as "a place called home." All rooms have private entrances, each with its own bathroom, kitchenette and dining area. Each room has a different view: some of the garden and pool and some of the mountains and city lights. Tyger Hills Guest House is situated less than 5 km from the Tijger Clinic, Tygerberg Office Park, Stellenbosch University Business School, Karl Bremer Hospital, Panorama Mediclinic and Tygerberg Hospital. The University of Western Cape is a mere 8km from us; Cape Town International Airport is only 13 km away and we are 20 km from Cape Town. The family room is a spacious room (+/- 35 - 40 m2) which can accommodate from one single guest up to a family of 2 adults and 2 children. It has its own private entrance from the outside and an open-plan layout (no separate bedrooms in the room). Bed configuration can be: King or Queen or Double bed, as well as one of the following: two single beds or a double bed. The private en-suite bathroom has a shower, toilet and hand basin. The kitchenette is equipped with a microwave oven, fridge, kettle, toaster, cutlery and crockery for self-catering purposes. Several amenities are provided in the room to ensure a comfortable stay, such as an air conditioner, television (DSTV Hotel Package with 50 channels), complimentary fibre optic Wi-Fi, dining table and chairs, study lamp, iron board and iron, hairdryer, extra blanket and basic guest amenities. Spacious open-plan double room (between 25 - 40 m2), with its own private entrance from the outside. It is fitted with a Queen bed, or two single beds (please request bed type in advance). It is ideal for an occupancy of one or two people. This open-plan double room (+/- 25 m2) with its own private entrance from the outside has a Queen bed. It is ideal for an occupancy of one or two people. There is no kitchenette or dishwashing facilities in this room, but a microwave oven, 130 litre bar fridge, kettle, toaster and basic cutlery and crockery are provided. This room (+/- 20 m2) has its own private entrance from the outside. It has a ¾ bed and is ideal for single occupancy. The kitchenette is equipped with a microwave oven, 130 litre bar fridge, kettle, toaster, cutlery and crockery for self-catering purposes. No smoking policy inside rooms. Ashtrays are provided in designated areas. Check-in time from 14h00. Please advise us of your estimated time of arrival. * Breakfast is available to corporate travellers with one day prior arrangement @ R100.00 pp and is served in the comfort of your room. 50% deposit required to secure a booking, balance payable on arrival. We accept EFT / cash / debit card / credit card (Mastercard / VISA). Full amount (100% deposit) required to secure a one-night booking. Individualized discounts for longer stays. Special rates for enquiries / bookings made directly at Tyger Hills via e-mail. We are listed on Google Maps as "Tyger Hills Guest House"
Drive for 500m. We are on the right hand side: 265 Uys Krige Drive. Turn right onto Hannes Louw Dr. 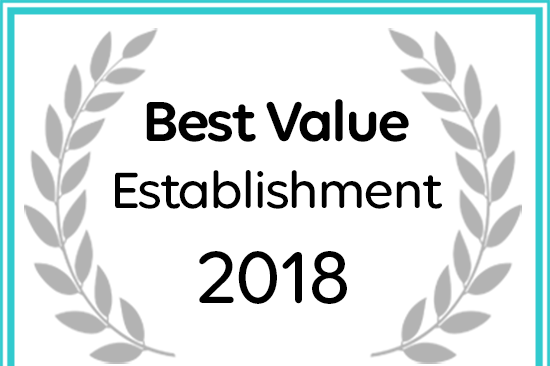 Turn right again at the robot/traffic light into Uys Krige Dr.
Tyger Hills Guest House has been named a Best Value Establishment on Afristay.com.